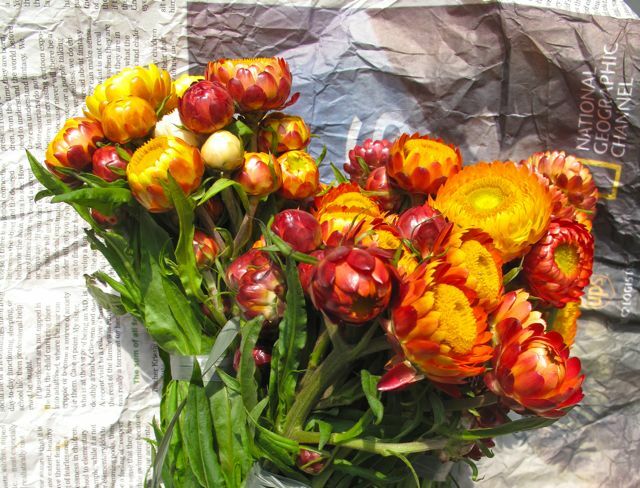 Otherwise known as “strawflowers” or technically of the family bracteata or bracteatum asteraceae, these vibrant, “papery” and somewhat intense blooms are often dried and the thing of childhood summer memories from trips to Baguio. I always thought of them as being a bit cheesy, a personal bias, but I spied these fresh bunches of the “everlasting flowers” and bought some at the FTI weekend market for PHP150 for three bunches. Several of the flower heads were still quite tightly closed, while others were starting to open. Fresh, and with their stems, they were quite the stunner. I took a low ceramic vase, cut the stems at about 7-8 inches in length, and stuck them in the vase without any water. I figured they might dry nicely and last a while. But honestly, I don’t know if that will work. I am writing this post 12 hours after I bought the flowers and they seem to be doing quite nicely. 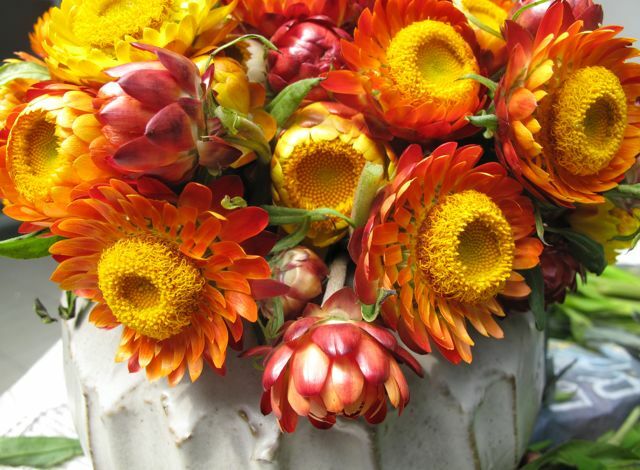 If you are interested, you can see more varieties of strawflowers at this site for seeds. I always see everlasting in leis but these fresh ones are gorgeous! Are they fragrant? I hope they dry up nicely in your vase and petals will not fall off since I always read that to dry flowers they have to be hang upside down in a dark cool dry area. the photos above really come to life! Garlands of everlasting flowers. Kodak 110 instamatic cameras with flashbulbs. i fondly remember kinder, prep and Grade 1 academic recognition days. i remember the scent…they’re lovely! Hi MM, sorry to correct you, the family of this flower would be Asteraceae. Scientific name would be Helichrysum bracteatum, “Helichrysum” would be the genus name, “bracteatum” would be the specific epithet. MM, you probably mentioned what type of camera you use for your photos before but I have forgotten. Your pics look so realistic. Beautiful! Ahh, “everlasting flowers” that simply refuse to die and even keep their natural colors. I got those too when I graduated from high school :-) Thanks for sharing MM. BTW, I love the 2nd shot with the wrinkled newspaper wrapping for a background. It has this “Impressionistic” quality to it. Ahh… 137.5° The Golden Angle, a beautiful and intricate pattern indeed. 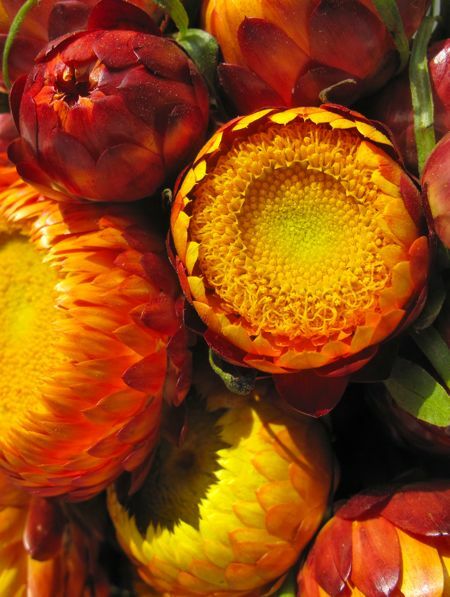 @ Pia, would these be a genus related to Proteas? 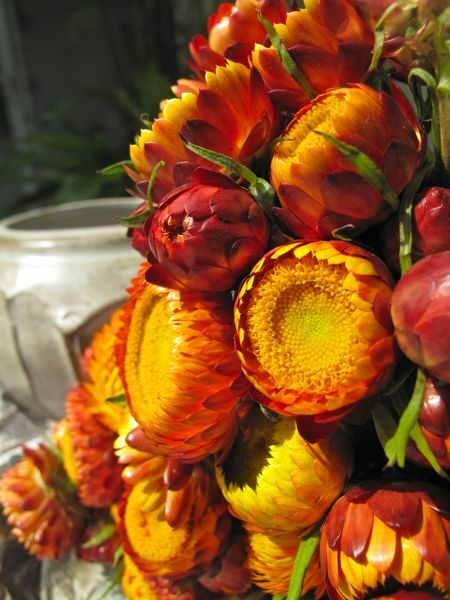 These sure look like proteas. the dried everlasting are horrible for my asthma – dust gathers among the petals, and the pollen flies at the slightest breeze, but your pictures made me see how beautiful they really are. Here in Pikes Market, Everlasting are available on summer time, i always thought they are cheesy too,as fresh flowers they are pretty, i buy them cuz it reminds me of home,they get discarded when the leaves are wilted.Beautiful pic!! I only knew the everlasting leis and i am always curious about how the plant itself looks like. I hope you can also show a photo of the whole plant,though i enjoyed your photographs. they are wonderful! thanks…. Yes, everlastings make memories live long. when we in high school we had an everlasting festival. keep up with those everlasting pics. Share more.. just in case you see blue everlasting flowers.